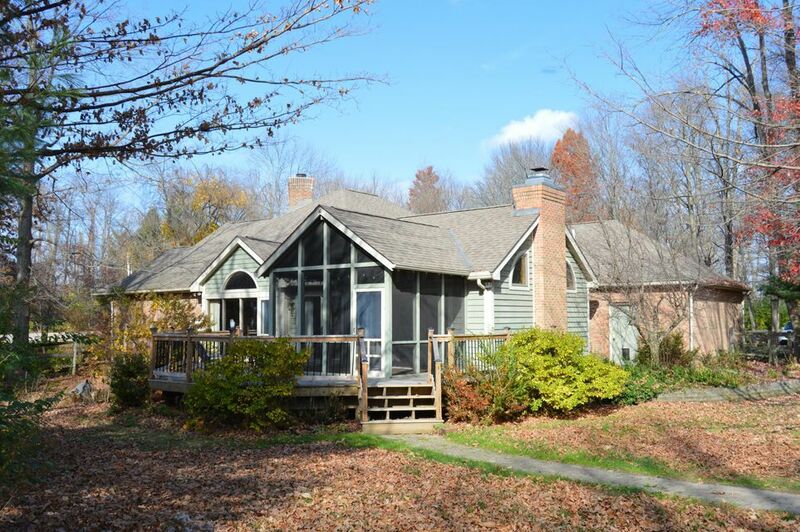 Fantastic brick ranch in a private wooded setting! This home features a contemporary flair and open floor plan, natural light and windows throughout. The attractive stainless steel kitchen opens to a cozy dual-sided fireplace. The dining room and living room overlook the beautiful natural setting, mature trees and large deck. The living room has an additional fireplace, sure to keep you toasty on cold winter nights, and custom stained-glass windows. This 3 bedroom home features a master-suite with a generously sized walk-in closet and spacious master bathroom. The ample outdoor living spaces include a screened dining porch, a large deck overlooking mature trees, an in-ground pool, sunning patio and large yard with lots of light for gardening.